A fishfinder/chartplotter has never been easier to control. The Hook2 SplitShot is the perfect option for those looking for an easy-to-operate unit with CHIRP and DownScan Imaging. Included mapping contains over 3,000 lakes which is displayed on the bright 5-inch SolarMAX display. 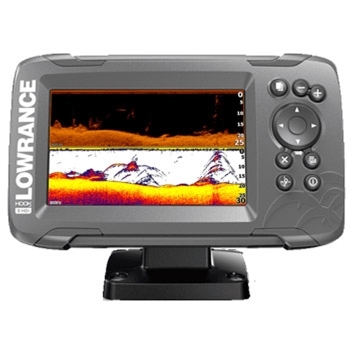 The Lowrance HOOK2-5 SplitShot with US Inland Lakes is a great solution for any fisherman or cruiser looking for a single Chartplotter Fishfinder for a smaller vessel. The bright 5” SolarMAX display boasts a crisp 800x400 resolution that is completely sunlight viewable, perfect for any boat with or without a bimini cover or t-top. Built-in detailed lake charts provide all you need to navigate and CHIRP sonar will provide you with depth and much more. The HOOK2 5 SplitShot with US Inland Lake charts is pre-loaded with detailed charting of over 3000 inland lakes. See detailed 1-foot depth contours so you will know where the ledges, drop offs and channels are. Along with preloaded detailed charting, you can upgrade the Hook2 5 by adding Navionics plus charting on microSD cards which will include SonarChart Live and Advanced Mapping features to highlight shallow areas, target a fishing range and adjust SonarChart™ contour density. 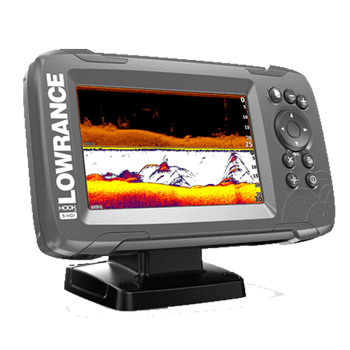 If you are looking for a high-performance sonar at an affordable price, this is the answer. The HOOK2 5 SplitShot features wide-angle CHIRP coverage in a traditional view (200 watts, max depth 500’) and DownScan imaging (500 watts, max depth 300’) for a much more detailed picture of the bottom. Both technologies are built into the included transom mount SplitShot Skimmer Transducer. 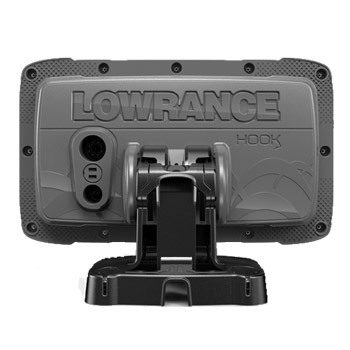 Lowrance also packed plenty of other features into the HOOK 2 like automated sonar settings, an internal GPS antenna, a simple dedicated keypad for easy operation and enough memory to store 3000 waypoints and 100 routes. Each Lowrance Hook2-5 SplitShot US Inland comes with: Quick Release Bracket, SplitShot Skimmer Transducer with Mounting Bracket, Power Cable. Looking for the same unit, with a Larger Display? Take a look at the Lowrance HOOK2 7 SplitShot. With Navionics PLUS South Region you will receive a pre-loaded microSD/SD Card with the Coastal Gold and Hotmaps Premium Lakes charts for the Southern Region. More than 1,600 lakes in AL, AR, FL, GA, KS, LA, MO, MS, NE, NM, OK, TN and TX, plus full coastal coverage including Bimini and West End. Protect your Lowrance HOOK2 5" Display from the elements with this Sun Cover. Compatible with 5" HOOK2 SplitShot and TripleShot units. Navico Quick Release Bracket for Lowrance HOOK2 4" and 5" Displays. Lowrance 10' Transducer Extension for Hook2 SplitShot and TripleShot Transducers. Compatible with Lowrance Hook2 5", 7" and 9" Splitshot and TripleShot GPS / Fishfinders. With Navionics PLUS Comes pre-loaded with the Coastal Gold and Hotmaps Premium Lakes charts for the US and Canada. Get access to Nautical Charts, Sonar Charts and Community Edits. With Navionics PLUS East Region you will receive a pre-loaded microSD/SD Card with the Coastal Gold Marine and Hotmaps Premium Lakes charts for the East Coast. Covering more than 7,000 lakes in CT,DE, IL, IN, KY, MA, MD, ME, MI, NC, NH, NJ, NY, OH, PA, RI, SC, TN, VA, VT and WV, plus US waters of the region’s Great Lakes and full coastal coverage. With Navionics PLUS West Region you will receive a pre-loaded microSD/SD Card with the Coastal Gold and Hotmaps Premium Lakes charts for the Western Region. More than 2,700 lakes in AZ, CA, CO, ID, MT, ND, NV, OR, SD, UT , WA and WY, plus Canadian waters of Puget Sound and full coastal coverage. With Navionics PLUS North Region you will receive a pre-loaded microSD/SD Card with the Coastal Gold and Hotmaps Premium Lakes charts for the Northern Region. More than 7,700 lakes in IA, MI, MN, ND, SD, and WI, all of Lake of the Woods and Rainy Lake, plus US waters of the region’s Great Lakes.